← Summer temperatures 2018 – the ‘new normal’? The arrival of a winter storm battering the British Isles with strong gales and widespread rain might well seem an unfamiliar sight after the long spell of warm and settled weather that we have just experienced this summer. 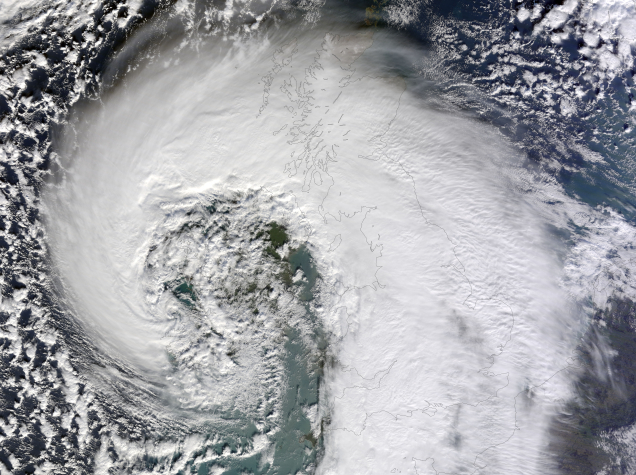 However, I am sure none of us has forgotten that these storms are common weather features here in the UK where winter seasons can get rather stormy, as 2013-2014 reminded us (see link here). Among the most damaging phenomena that can be associated with winter storms there is one, a strong descending air stream called sting jet , that in recent years has started to receive a lot of attention in the research community and in the media. A sting jet was firstly formally identified in the Great Storm of 16 October 1987 and in several other storms since then and, as discussed in a previous blog entry ,there are indications that their frequency, along with the associated wind risk, will increase in a warmer climate. The Department of Meteorology has historically been and still is at the forefront of this research topic, whose current state of knowledge is reviewed in Clark and Gray (2018). In particular, in the last decade observational, modelling and climatological studies confirmed that sting jets can occur in intense extratropical cyclones in which a gap opens between the cold front and the back-bending warm front. It is in this frontal fracture region that the sting jet descends and accelerates, causing near-surface strong winds that are neither caused by the cold nor by the warm conveyor belt. The main area of debate concerns now the dynamics of sting jets: how do they form, descend and accelerate? Our work (Volonté et al., 2018) addresses these questions using numerical weather prediction simulations of a sting-jet‐containing storm (windstorm Tini, see Figure 1). Through the use of Lagrangian trajectories (Figure 2), vorticity budgets and frontogenesis diagnostics we assess the relative importance of the release of mesoscale instabilities and synoptic‐scale cyclone dynamics. These simulations highlight the presence of a sting jet, whose descent and acceleration are initially influenced by sublimation and then largely driven by the release of mesoscale instabilities on the airstream. Figure 3 shows the mechanism playing a major role in the onset of these instabilities, with frontal circulations in the cloud head associated with combined tilting and stretching of vorticity on the sting jet. Vorticity and frontogenesis fields form a narrow slantwise banded structure in the cloud head, different from the widespread frontolysis expected from the large‐scale dynamics alone in the frontal‐fracture region. This mechanism enhances the strong winds already generated in the area by the synoptic-scale cyclone dynamics and does not develop in simulations with insufficient model resolution, as our study shows. 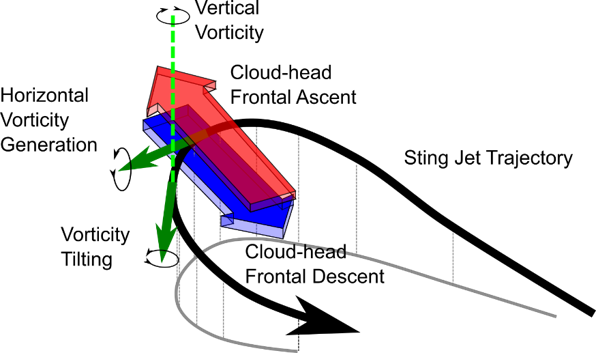 In fact, while the sting jet undergoes a process of destabilisation that strengthens its descent and acceleration in the higher‐resolution simulation, this process does not occur in the sting jet produced by a coarser‐resolution simulation, resulting in weaker winds and no instability generation or slantwise banded structures. This analysis reveals the synergy between the paradigms of sting jet occurrence through the release of mesoscale instabilities and synoptic‐scale cyclone dynamics. Although this is a substantial step in understanding the mechanisms driving the formation and evolution of sting jets, further work is still necessary. These results have been obtained via the analysis of a case study, albeit a very clear one, and so their robustness needs to be assessed in a more general framework. For this reason, idealised simulations of sting-jet containing cyclones are currently being analysed. By this investigation we aim to shed light on the importance of the aforementioned enhancement mechanism in sting-jet storms with different properties, along with assessing the dependence of sting-jet occurrence and strength in different environmental conditions. This entry was posted in Climate, Climate change, extratropical cyclones, Monsoons, Numerical modelling, sting jet, University of Reading, Weather, Weather forecasting. Bookmark the permalink.